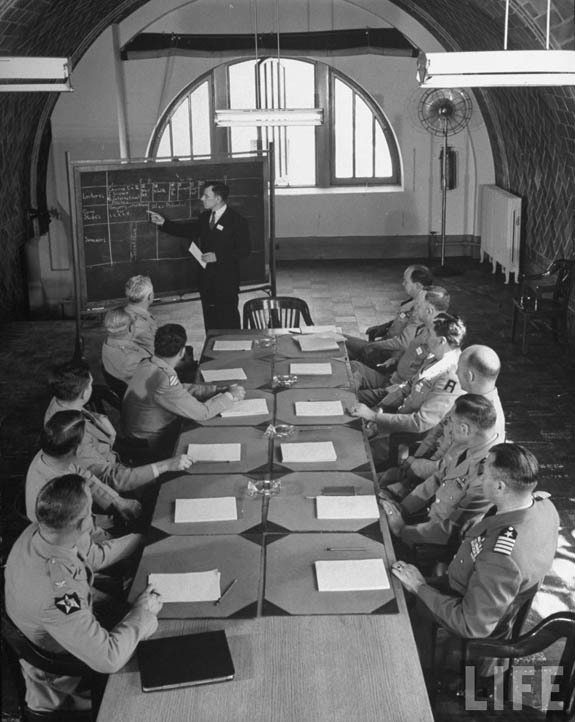 Original Caption: “Professor Bernard Brodie conducting a class.” September 1946. Walter Sanders, photographer. Professor Brodie understood the bomb’s power very well, but not it’s weakness. The Japanese, even after they became aware of the bomb’s ability to destroy a whole city, were undeterred: they didn’t care about their cities, only about their army, as Ward Wilson has so clearly shown. The Soviets valued their cities, apparently, and were deterred, but from the Vietnamese to Al Qaida to Putin’s Ukrainians, any force that can attack a nuclear power without providing it a nuclear target is undeterred. A nation that focuses on it’s strength, and ignores it’s weakness, is as doomed as Tolkein’s Smaug. Which is the point Brodie was making in the last sentence quoted, about “progressive improvement in world affairs”. We would do well to heed his advice in that regard, especially when considering our budget for military vs. civilian foreign aid.